The borough was formed in 1965 by the London Government Act 1963 as the London Borough of Barking. The constituent parts were almost all of the Municipal Borough of Barking and the greater part of the Municipal Borough of Dagenham. At the time of the amalgamation the combined population of Barking and Dagenham was around 180,000, the northern tip of Dagenham having been incorporated into Redbridge and a small area of Barking in Newham. The borough was renamed Barking and Dagenham in 1980. In 1994 the part of the Becontree estate in Redbridge was transferred to Barking and Dagenham. The area covered by Mayesbrook Park in the Borough was once part of the historic Manor of Jenkins, seat of the Fanshawe family. The borough borders the London Borough of Havering to the east with the River Rom forming part of the boundary. 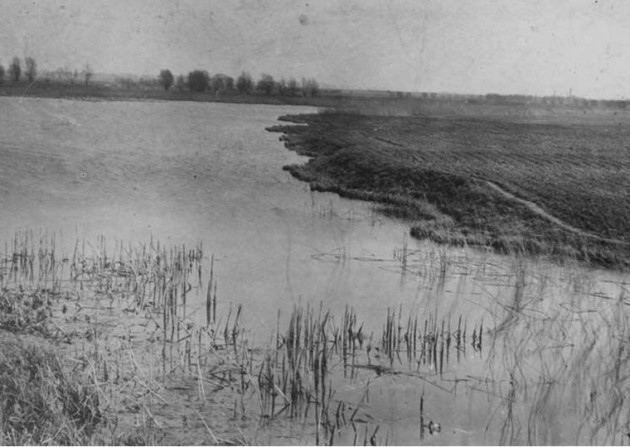 It borders the London Borough of Newham to the west with the River Roding forming much of the border. To the south is the River Thames which forms the borough's boundary with the London Borough of Bexley and the Royal Borough of Greenwich. To the north the borough forms a thin protrusion between Havering and the London Borough of Redbridge in order to encompass Chadwell Heath. 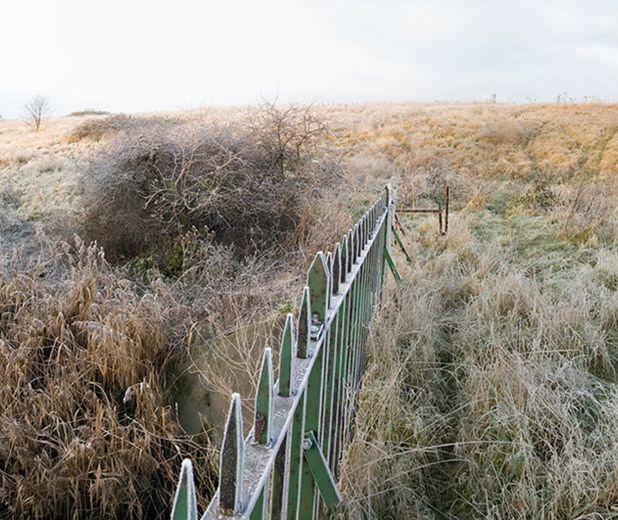 530 hectares within the borough are designated as part of the Metropolitan Green Belt. The borough's major districts include Barking, Becontree and Dagenham. It borders five other London boroughs: Newham, Redbridge, Havering, and Greenwich and Bexley to the south of the Thames. Much of the housing of the borough was constructed by the London County Council during the interwar period of 1921-1939. Major settlement of the area, mostly escaping slum conditions in the East End of London, occurred during this period when the new motor and chemical industries such as the Ford Motor Company plant at Dagenham were set up. Since the decline of these industries in the 1980s, employment has shifted towards service sector jobs. Much of the borough is within the London Riverside area of the Thames Gateway zone and is the site of considerable house building and other development. 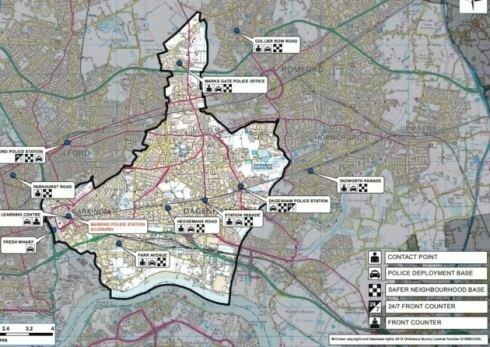 A £500 million budget has been earmarked for redevelopment of the borough's principal district of Barking. The population rose dramatically between 1921 and 1931, when the London County Council developed the Becontree Estate. 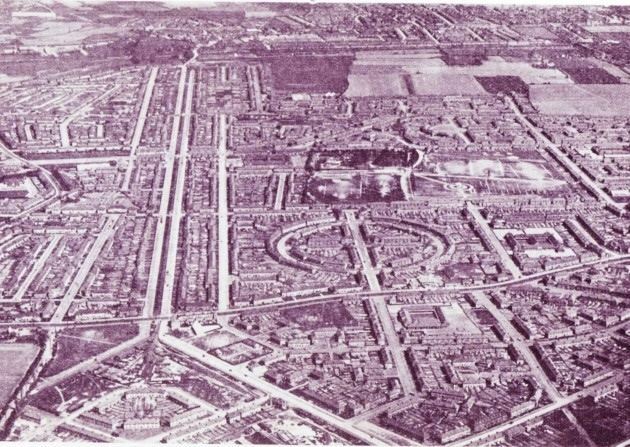 This public housing development of 27,000 homes housed over 100,000 people, split between the then urban district councils of Ilford, Dagenham and Barking. People were rehoused from the slums of the East End. In 1931, the Ford Motor Company relocated to a 500 acres (2.0 km2) site at Dagenham, and in 1932 the District line was extended to Upminster; bringing further development to the area. Barking and Dagenham had by far the largest decrease of the 65+ population, having dropped almost 20% between 2001 and 2011. There were 69,700 households in the borough in 2011, up 3.6% from 2001. The borough also had the largest proportion of school-age (5-19) population of all the local authorities in England and Wales, 21.4%, at the 2011 census. The borough's pre-school (0-4) population rose by 49.1% from 2001 to 2011, by far the largest increase in London. The borough is covered by two parliamentary constituencies: Barking; and Dagenham and Rainham, first contested in 2010. The borough is within the City and East London Assembly constituency, returning John Biggs AM, as the directly elected Assembly Member. Barkling and Dagenham is part of the London constituency in the European Parliament. The council has a Mayor, who is elected at the council annual general meeting by councillors. The Mayor must be a serving councillor, although the role of Mayor is non-political. The Mayor chairs council meetings; and performs ceremonial duties in the Borough. There are 17 wards in the Borough, each returning 3 councillors, making 51 in total. At the Barking and Dagenham Council election on 4 May 2006 the Labour Party were returned with 36 councillors. From 2006-2010 the British National Party formed the largest opposition party on the council with 12 councillors (later reduced to 11 in a by-election), the Conservative Party had two (later reduced to one in a by-election), and an independent was elected. In the Barking and Dagenham Council election on 6 May 2010; all 51 councillors elected were from the Labour Party. There are many schools and further education facilities in the borough. Situated near the Town Hall, the Barking Learning Centre is a learning facility providing a range of courses leading to recognised qualifications. It also includes a library with free public internet access, the Council's first One Stop Shop, conference and meeting space, a gallery and a café. The University of East London formerly had a campus in the borough, however this has now closed with all campuses now being located in the neighbouring borough of Newham. The London Borough of Barking and Dagenham is served by the Hammersmith & City line, the District line, c2c and London Overground. The following tube stations are in the borough: Barking, Becontree, Dagenham East, Dagenham Heathway, Upney. There is also Dagenham Dock railway station. Chadwell Heath station is in the London Borough of Redbridge, but right on the border with Barking and Dagenham. London Buses: routes 5, 62, 66, 86, 103, 128, 145, 150, 169, 173, 174, 175, 238, 247, 287, 296, 325, 362, 364, 366, 368, 499, EL1, EL2, EL3; 687, 673 (school buses) and N15 and N86 (night buses). There are 3 main routes 5, 86 and 238 which provide links further east towards Stratford and Canning Town and route 62 provides a link from the south to the north of the borough. Barking Station is one of the largest railway stations in East London providing links to Central London, Gospel Oak and Shoeburyness. In March 2011, the main forms of transport that residents used to travel to work were: driving a car or van, 22.5% of all residents aged 16–74; underground, metro, light rail, tram, 7.5%; bus, minibus or coach, 7.5%; train, 7.3%; on foot, 3.7%; passenger in a car or van, 1.7%; work mainly at or from home, 1.3%. Time 107.5 FM broadcasts from Romford and covers Barking Dagenham and surrounding areas and brings local people up to date news. Bedrock is the local Hospital radio service available on-line and broadcasts a range of health related information focused around the local Hospitals; King George Hospital, London and Queen's Hospital. The London Borough of Barking and Dagenham has two fire stations within its boundary: Barking and Dagenham. Barking fire station operates two pumping appliances, a bulk foam unit and a command unit. The support units that are operated here will cover a large selection of station grounds and areas. Dagenham fire station operates two pumping appliances and a hydraulic platform. Of the two stations; Dagenham is the busier, attending over 2,000 incidents in 2006/2007. The coat of arms of the borough displays the Curfew tower of Barking Abbey in its crest.